Fresh berries are one of the best parts of summer. During their peak season I wind up eating them practically every day, throwing a handful into my cereal, making smoothies, or simply eating them plain. Last weekend I came home from the supermarket with a ton of fresh blueberries, raspberries, and blackberries, and decided to put them to very good use in a mixed berry pie! Berry pies are great treats for this time of year. Not only do they showcase the flavor of the berries when they are at their best, but they are remarkably simple to prepare, requiring only a few common ingredients. For my pie I chose to mix blueberries, raspberries, and blackberries in equal amounts, but you can easily change the recipe to suit your taste. Just keep the volume of the berries the same, and you can mix and match them as you please! Dough for a double crust in a 9in pie pan, either from scratch or a pre-made crust. 1) In a medium sized bowl, gently mix berries, tapioca, sugar, lemon juice, and vanilla. Set aside, and let rest at room temperature for 15 to 20 minutes. 2) Meanwhile, preheat oven to 400° and prepare your pie crust according to recipe/package directions. Place the bottom crust in an ungreased 9in pie pan, trimming any excess dough around the edge. Roll out your top crust so that it is about one inch larger around then the rim of your pie pan, and cut an X into the center, about three inches in length. 3) Pour filling into the prepared pan and dot with butter. Cover with top crust, carefully peeling back the cut sections in the middle to make a square hole, allowing steam to escape during baking as well as making a neat looking window to show off the filling. Seal the edges by tucking in the extra dough around the side, and press the dough down all along the rim with a fork. 4) Make an egg wash by whisking one egg yolk with a teaspoon of water until slightly frothy. Lightly coat the top crust with a very thin layer of the mixture. The wash will make the crust a nice, shiny golden-brown after baking! 6) Cover the rim of the pie with tinfoil to prevent the edges from burning. Bake for 35 minutes, then remove the foil from the rim and continue baking another 10-20 minutes, until crust is golden brown all over. Remove from the oven and let cool. 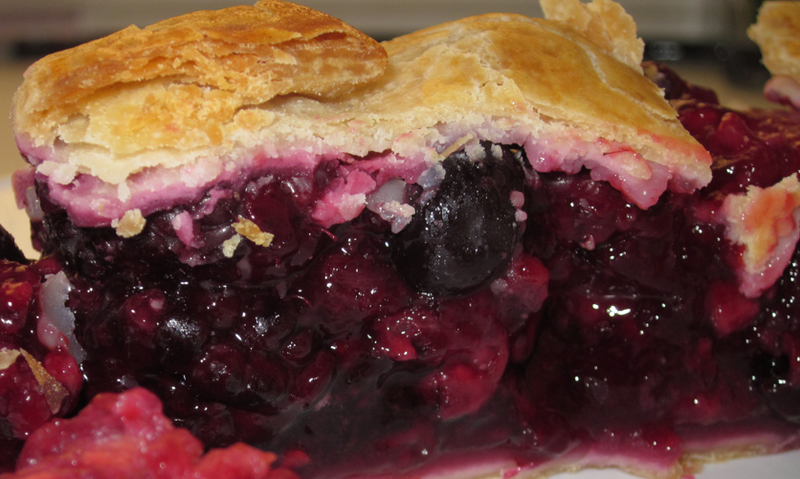 For a warm, gooey pie allow to cool for around half an hour then serve. If you prefer your pie to have a thicker, set filling chill in the refrigerator for a few hours or overnight before serving. Enjoy!